PAPETTE, Tahiti—It was the third night of FIFO and the uniformed High Commissioner of the Republic in French Polynesia was hosting us at his palatial home. Formal greetings included a long phalange of French dignitaries who each ceremoniously kissed us first on one cheek and then the other. No air-kissing here, to the dismay of some of the Australians in attendance. 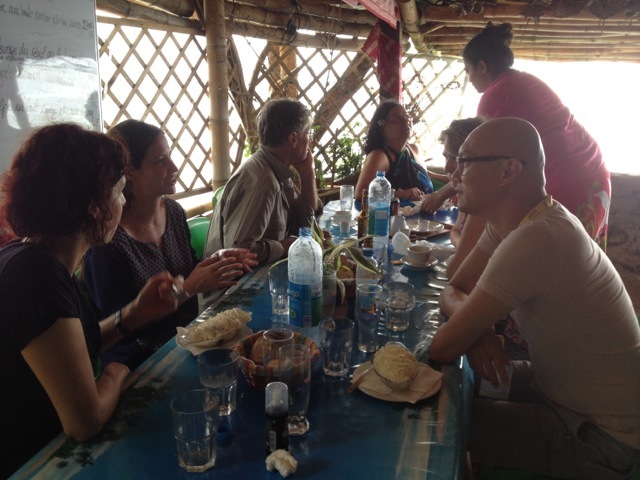 With us, enjoying the festive occasion, were several vegetarian FIFO festival colleagues. 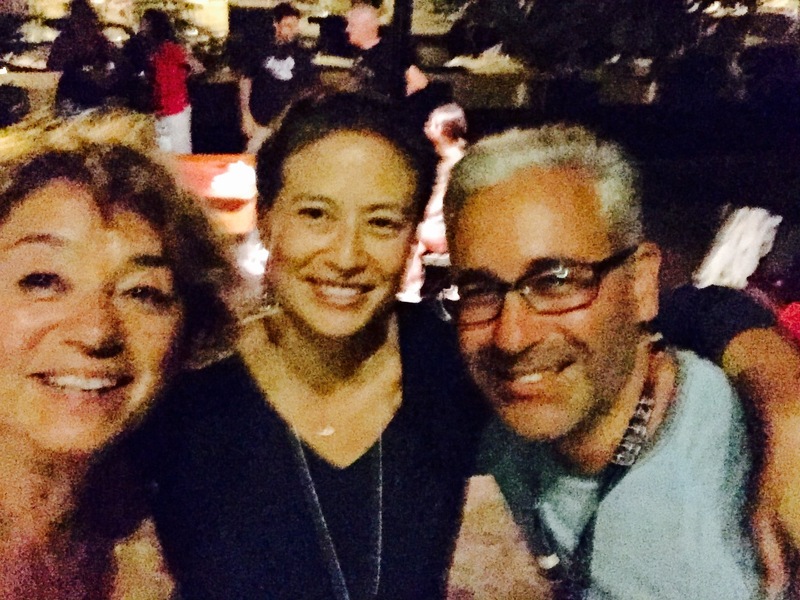 Dan Shanan, festival juror and director of the New Zealand Doc Edge Fest, and Lisette Flanary, University of Hawaii film professor, were baffled by the lack of vegetarian options at the buffet. They asked for my expert opinion as their taste-tester. Perhaps being a citizen of the Berkeley gourmet ghetto imparted such status? I didn’t ask why, but set about scrupulously sampling more than my share of treats, most of which were wrapped in bacon or filled with seafood … and yummy. Finally, the green-tinged puff pastry with savory garlic-flavored mushrooms made my cut. Well, I thought they were mushrooms. They turned out to be snails, much to the horror of my unwitting colleagues, who had filled up on them at my recommendation before asking a waitstaff member for a more expert opinion then mine. It was well into the champagne and French pastry course before I received their absolution for my unwitting crime. That evening followed cocktails and live music at the President of French Polynesia’s palace and one at the Minister of Culture’s luxurious digs. The delightful surprises were myriad at this small, collegial and extraordinary documentary film festival. 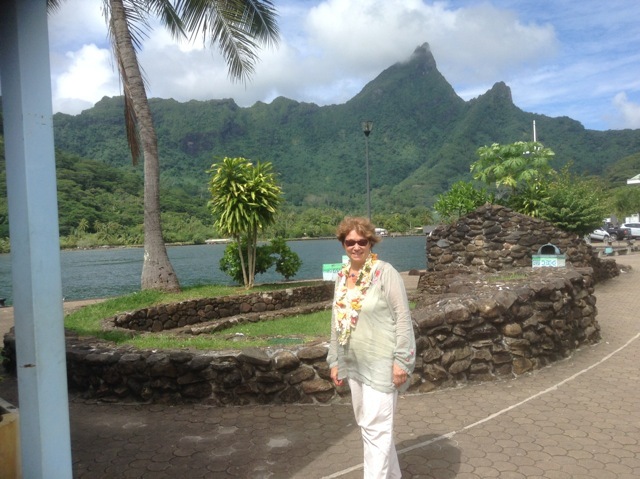 I was already seduced by the eye-opening film selection, participants from remote islands across the Pacific, tropical breezes, turquoise lagoons, Polynesian music and dance, ice-cold fresh coconut water sipped from the shell, and surprising French/Tahitian cuisine. The festival got off to a remarkable start. Day One, billed by the organizers as a “relax day,” was spent lounging around a tiny motu (island) which faced another divine motu where, we were told, Bill Gates had celebrated a recent birthday—i.e., not too shabby. The first stop after a ferry ride to Moorea and boat ride to the motu was swimming with whitetip reef sharks and large stingrays. “You may pet the stingrays but not the sharks,” our implacable Tahitian guide instructed, as a stingray swam up his arm for the fish he offered. 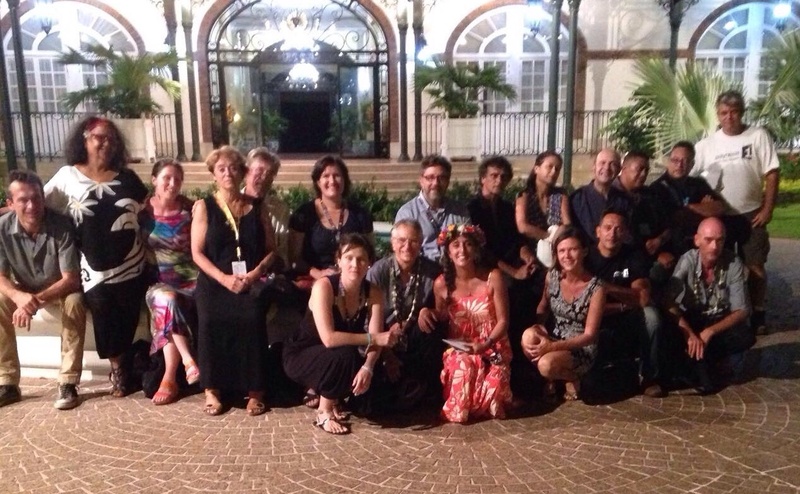 We were accompanied by a gaggle of French, Pacific Island and Australian producers, directors and filmmakers, the minister of culture of the nation, and stars from several films, including the aboriginal blues singer and former Australian Black Panther Marlene Cummins. FIFO treated us to an abundant buffet including Poisson Cru, an array of tropical fruit, lovely salads and the staple breadfruit, which I’m still trying to like. (So far: No go.) 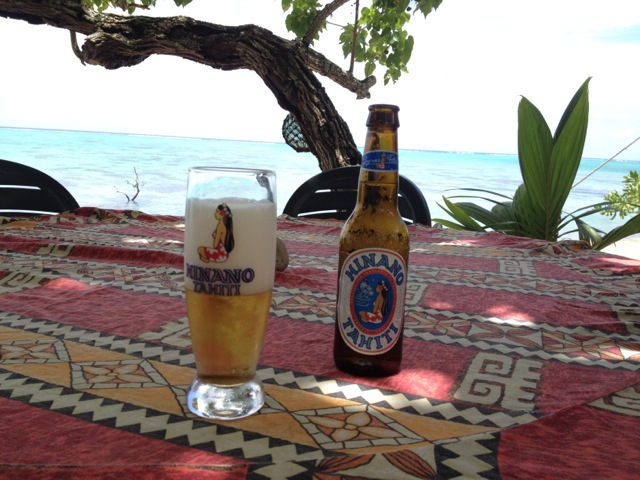 The rest of the day was spent getting to know each other while lounging in a turquoise crystal clear lagoon and drinking the local and very pleasant Hinano Beer. At day’s end, we were all slightly sunburnt and the best of pals. It was arguably the most perfect Day One of a festival in memory. The only mainland American participating, my invitation was secondhand, riding on the coattails of my Australian partner, producer and distributor, who was invited to the pitch dating for Oceana filmmakers interested in Australian theatrical release. I was able to successfully pitch a film we are producing on East Timor (now Timor Leste), snagging the interest of a stellar French producer/broadcaster. I also found a second kindred spirit—an impressive French producer interested in my current production, about Internet freedom and an Icelandic Pirate Party “Poetician” who was formerly a WikiLeaks spokesperson. His production company made the recent film Snowden’s Great Escape . 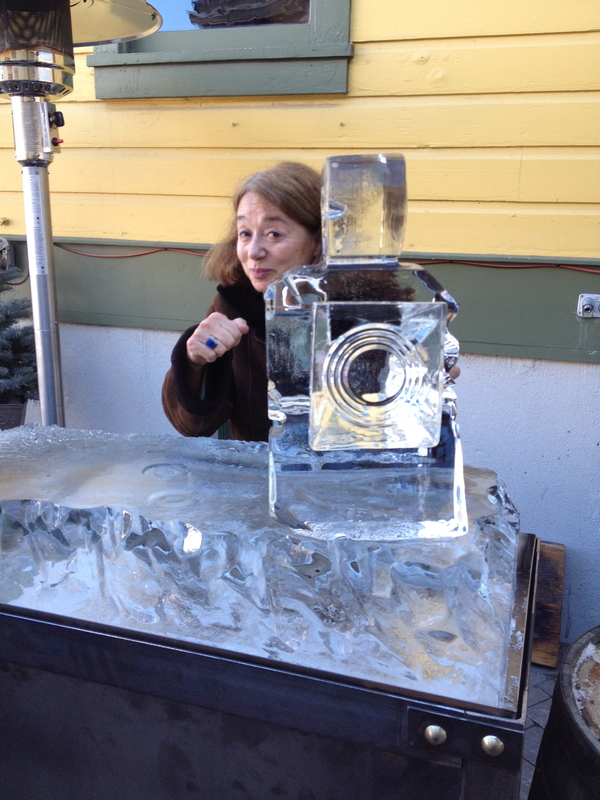 My documentary’s main character, Birgitta Jonsdottir, attempted to provide Edward Snowden with asylum in Iceland. It’s a good fit. Our companions were a gloriously diverse bunch of filmmakers, broadcasters and distributors from Tahiti, France, Australia, New Zealand, New Caledonia, PNG, the Solomon Islands, Fiji and Hawaii. New worlds of filmed cultural experience, filmmaking challenges and opportunities, were meted out daily, along with surprising stories about the lives of documentary subjects and indigenous and colonial traditions. Who knew that the Chileans colonized and kept the Rapanui, the native peoples of Easter Island (who built those monumental sacred sculptures) as prisoners on their own land for decades, until an uprising in 1969? Or that one brilliant French lieutenant commander saved French Polynesia and perhaps the Pacific from the German navy in WWI? 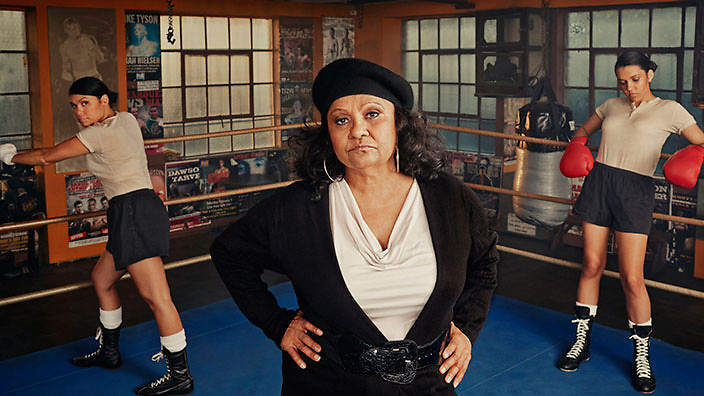 Where else would you be introduced to the Black Panther movement as lived in Australia by a phenomenal Aboriginal blues singer and storyteller—a keeper of the traditions and a courageous truth teller about the subjection and abuse of women within the movement and the culture? Black Panther Woman won the Special Jury Award, and got my vote for best picture. Tender won the grand prize with an inspiring Australian story of community, faith and caring for the dead without corporate profit. Kumu Hina , a Hawaiian story with ITVS funding and a PBS broadcast scheduled for the spring, revealed the Hawaiian tradition of Mahu, embracing both masculine and feminine spirit. Hina was a powerful presence at the festival, and the film won the audience award and a jury award. I’ve been to many film festivals with The Most Dangerous Man in America: Daniel Ellsberg and the Pentagon Papers, from Toronto to Hong Kong to Madrid; from DocAviv to Amsterdam’s IDFA. The film and I have been to Iceland; Sheffield; Palm Springs; Michael Moore’s Traverse City film fest in Michigan; Vancouver; SLO; Seoul; Sydney; and even my hometown Napa Valley Film Festival. FIFO was certainly among the most hospitable, surprising and charming of the lot, and worthy of comment regarding eat, drink and film. 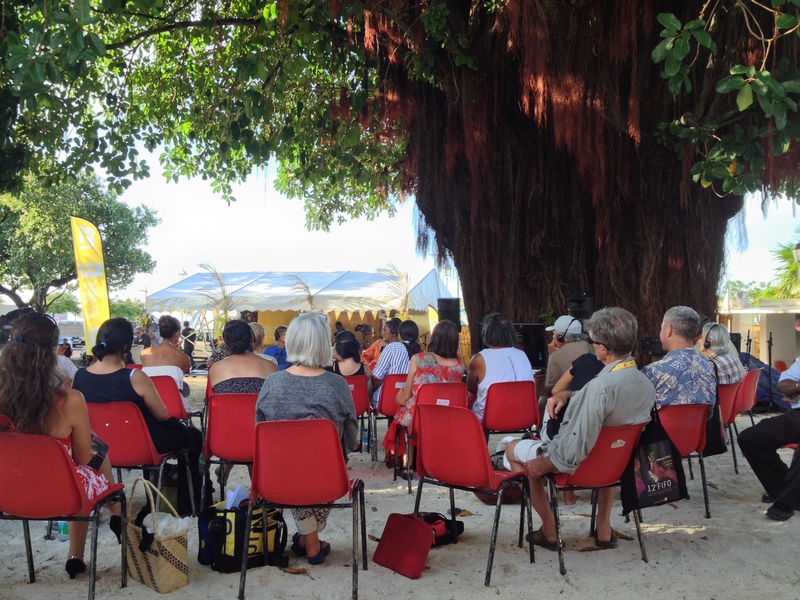 In addition to well-appointed and ample theaters, the setting—the Maison de La Culture on Papette’s waterfront—offered a delightful and largely open-air setting for the festival. “Inside the Doc” intimate conversations with directors in the days following their screenings were conducted under a majestic banyan tree. 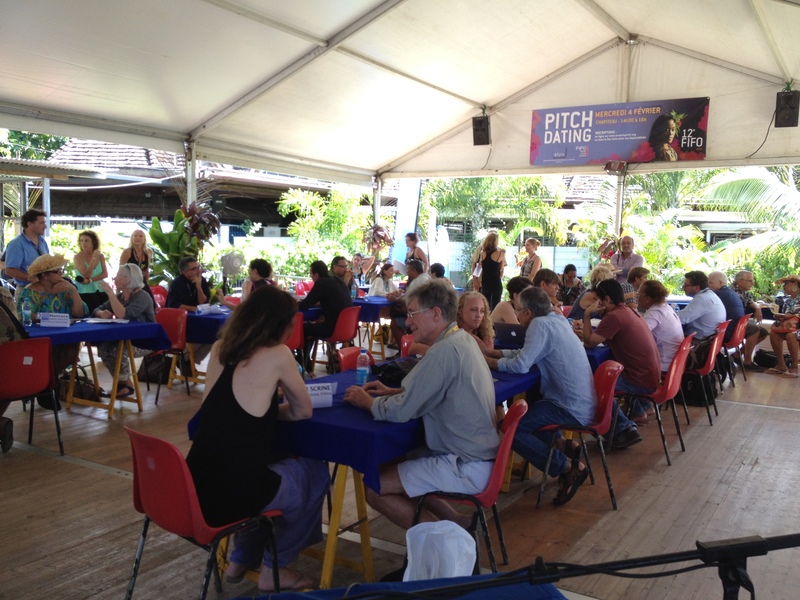 Lively pitch dating sessions and meetings were held under a massive canopy with tropical breezes at the ready. Reasonably priced food (in this expensive city) was available in an open air café between theaters. Near the end of our sojourn, the lovely French/Algerian festival coordinator Khadidja Benouataf invited eight of us on a tour around the island, including a visit to an impressive Maare or sacred temple, the legendary surf break Teahupo’o, and lunch at one of those magical spots you only dream about. “KD” called “La plage de Maui” her secret spot. 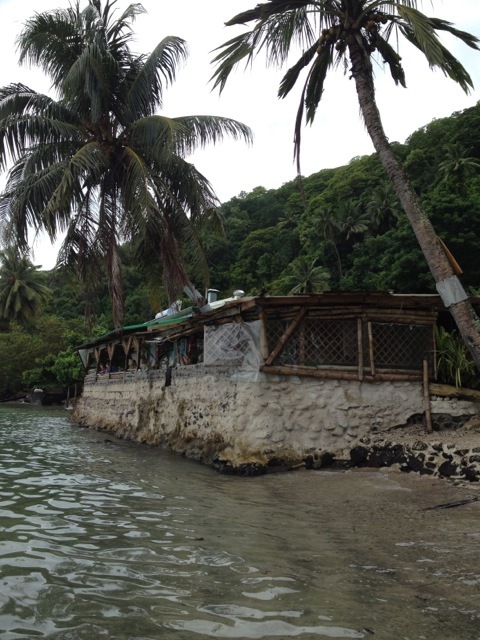 It’s a picture-perfect, thoroughly unpretentious beachfront cafe serving large platters of miraculously fresh seafood. You can take a dip in the 80-degree translucent lagoon while the meal is being prepared, and we did. Khadidja takes a sampling of FIFO films worldwide, and we informally discussed expanding a FIFO outpost in San Francisco. Perhaps it could augment the Alliance Française-sponsored French Film Festival here as it does elsewhere? The festival ended with an awards ceremony that didn’t disappoint. I find the final event usually a requisite low point of film festivals, but not so here. It seemed as if everyone, including the most sober male bureaucrats, broke into a wild knee-banging Tahitian hula dance when the Polynesian drums heralded each winner. Between awards there was fabulous music and dance celebrating Tahiti’s traditional arts. Gauguin came to mind as I enjoyed the astounding beauty and grace of the men and women on stage. These must have been among the island’s most talented. 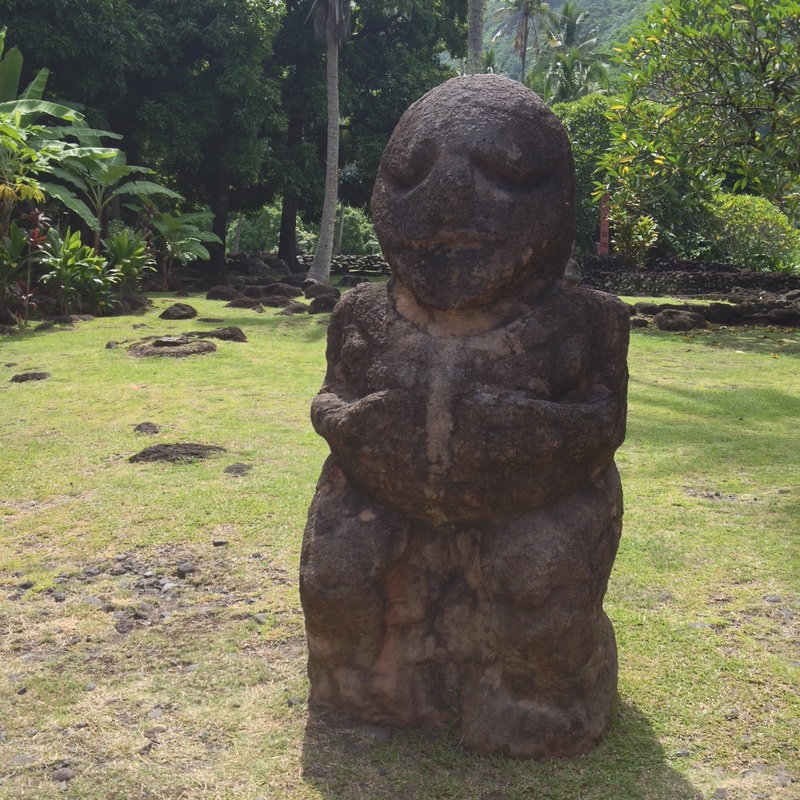 FIFO is one of the two most important cultural events in the Tahitian calendar. But in the spirit of eat and drink as well as film, a note on Tahitian cuisine. If you like sashimi, you are in luck. Raw tuna is served in five variations on the average menu. The most common is tuna in coconut milk, and it is a revelation. Poisson Cru or E’ia Ota (Tahitian Lime-Marinated Tuna), the iconic Tahitian dish, is similar to Latin ceviche or Hawaiian poke, but differs primarily in the addition of coconut milk, which softens its flavor. Variations abound but a bed of cabbage, carrot and cucumber seemed the most common. Another wonderful Tahitian tradition that has hit our area more recently in the food truck gatherings is found In crowded downtown Papatte. There are nightly gatherings of Les Roulottes—the largest and most organized is on the waterfront, an area that has recently been completely renovated. The roulottes or dining cars offer a variety of food. Asian cuisine dominated at the late-night session when we found ourselves peckish after the opening night films. I noticed that the choices were tripled earlier in the evening, and I suspect the variety was greater as well. Okay, there was one drawback in paradise—there would have to be, wouldn’t there? Chikungunya, a very nasty mosquito-borne disease, is expected to infect half the population of French Polynesia within the year with a debilitating fever and joint pain. We were notified as we landed to take precautions and keep applying insect repellent. The final odd attempts to control the spread of the disease included spraying all the passengers before take-off on my Air French flight heading to LA. The insecticide was declared non-toxic. Hmmm. But that isn’t the odor still filling my senses. That would be the seductive scents of Tahitian Monoi coconut oil … perhaps it’s the eight bottles including sandalwood, vanilla and Tiari that I brought home with me, as well as memories of an extraordinary week in documentary paradise. To prepare, in a glass bowl, mix lime juice (2 oz per pound of fish), coconut milk (3 oz per lb of fish) and seasoning to taste. Add the fish, raw salad vegetables (tomatoes, carrots, spring onions, etc.) and the grated zest of one lime. Mix, season, and serve immediately. Judith Ehrlich co-produced and co-directed the award-winning PBS/ITVS documentary The Good War and Those Who Refused to Fight It (2001) and the Oscar- and Emmy-nominated, Peabody-awarded documentary The Most Dangerous Man in America: Daniel Ellsberg and the Pentagon Papers (2009). She’s currently in production on two films: The Mouse That Roared, about a crusading Icelandic “poetician”; and The Boys Who Said No, the story of Vietnam-era draft resisters. She’s also made dozens of prize-winning educational films and radio documentaries on subjects including the peace movement, education, citizen participation and low-income housing. Ehrlich teaches documentary film history at Berkeley City College. judithehrlich.com. This entry was posted in Eat, Films and tagged Festival International du Film Documentaire Océanien, FIFO, French Polynesia, Judith Ehrlich. Bookmark the permalink.